We're sorry, but these are very old, very dated articles. Best buys in used Macs is such a moving target that we simply can't keep up to date and have given up even trying. Please read these in their historical context, as some of these articles were written in the early years of Low End Mac. There's a lot to like about the PowerBook 1400: it was the first PowerBook with a CD-ROM, it offered decent power, wasn't too heavy, and had a very nice 800 x 600 pixel color screen. It's not an inexpensive notebook, as is the PowerBook 540c, but it does run a PowerPC processor, has a larger screen, and even takes G3 upgrades. A quick search of the Web shows used 1400s selling for US$500-800, depending on CPU speed, screen, memory, and accessories. If you're planning on dropping in a G3 upgrade right away, look for the 117 MHz model (which otherwise merits the Road Apple label for poky performance compared with the 133 MHz model). 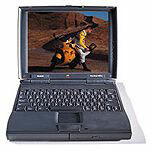 Compared with the larger, heavier iBook, a used 1400 with a G3 upgrade can be a real value. For a total cost of around US$1,000 you should be able to pick up a 1400/117 or 133 with 40 MB of memory and the Sonnet G3/333 upgrade. This will give you a bit more performance than the iBook without the bright iBook colors. At today's prices, the PowerBook 1400 doesn't quite merit best buy status, but it's definitely worth considering if you need a PowerPC processor, CD-ROM, or 800 x 600 color screen. Maybe that's why the four-year-old 1400 is relatively rare on the used market. The PB 1400's only drawback: It doesn't come from the factory with a modem or ethernet connection, so you may need to buy a PC Card to gain those capabilities.